While Fay Thomson’s name may be relatively new in the local phone book, her signature has run along the bottom of paintings displayed at the Franklin Arts Festival for years. Along with her husband Ian, Fay moved to Waiuku from Tauranga – where her work was also well received – in 2015. Since taking up the brush relatively late in life (during her 50s) this talented artist has made up for lost time. Using oils and watercolours she paints the world her way. 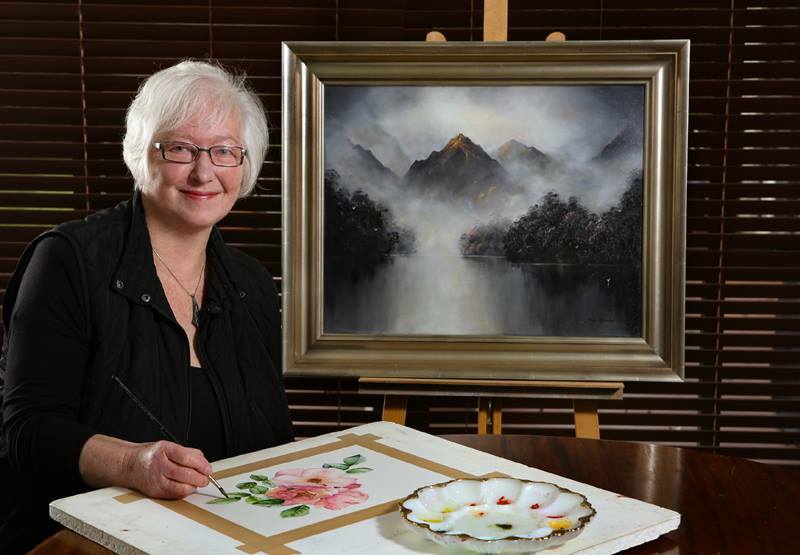 Painting has become a self-sustaining hobby netting enough from sales to cover her costs for paints, canvases, books, exhibition entry fees and the like. Boats often bob up in Fay’s work; unsurprising considering her sweetheart once rode a ship on the sea. Raising children and working as a legal secretary didn’t allow much time for hobbies, Fay attests, and yet, in the 1990s, she discovered in herself an untapped wellspring of creativity. “I saw an exhibition by [acclaimed New Zealand artist] John Speedy and I fell in love with his work! Both Ian and I later put our names down for a workshop. family!” she laughs. Although there’s no arts degree (of any degree) to Fay’s name, through workshops and books, she has garnered knowledge from the best. From Susan Harrison-Tustain and Richard Robinson, to Tim Wilson, her list of tutors is a veritable ‘who’s who’ of the Kiwi contemporary art scene. In a relatively short time, Fay has met with plenty of acclaim picking up a number of accolades and twice reaching the finals of the prestigious Miles Art Award. Early this year, the Franklin Arts Centre exhibited Fay’s work. Festival’s Miniature Painting Category a few years back. This year, this gifted painter will exhibit again and, this time, she hints there’s a chance her submission could include a locally-inspired piece.